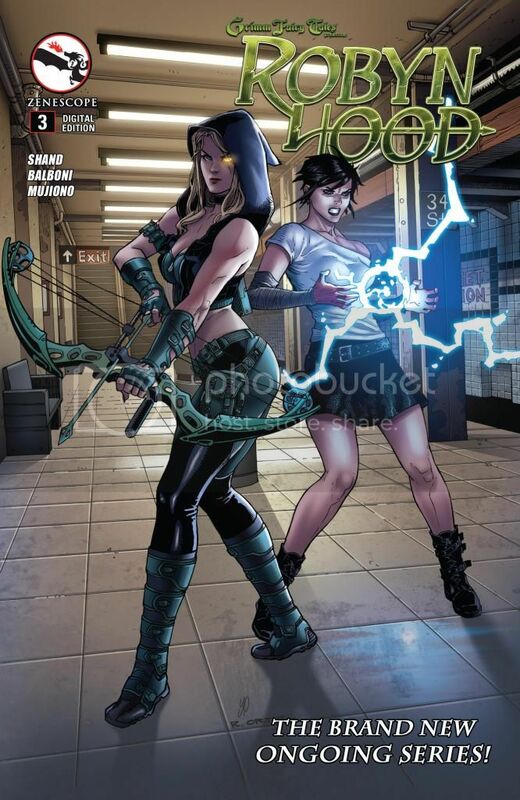 Robyn Hood #3 (Published by Zenescope; Review by Draven Katayama; ‘Rama Rating: 6 out of 10): The premise of this recently launched series is that expert archer Robyn Hood and spellcaster Marian Quin have been transported from a magical land to the concrete jungle of New York City. Robyn’s archery ability is regrettably underutilized – she shoots one arrow in this issue, and her grappling fighting style makes her more akin to Black Widow than Hawkeye. I like Robyn and Marian’s friendship and dynamic as equal partners. Claudia Balboni’s foreground characters are too starkly set off from the background, at times giving a video game-like aesthetic. A welcome surprise is that the interior art is not evocative like most Zenescope covers. Pat Shand is developing two fun leads into multifaceted characters. Robyn and Marian’s solid teamwork is a rare find.